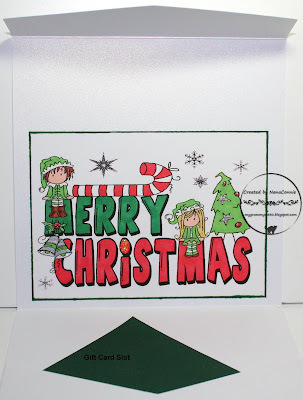 This is my project for the 3rd day of the Christmas in July challenges at Catch the Bug. So far, I've managed to play each day and I'm doing my best to keep time clear each morning for creating that day's card. The theme today is to make a gift or a gift card holder. Since I'm always in need of gift card holders over the holidays, I make lots of these. 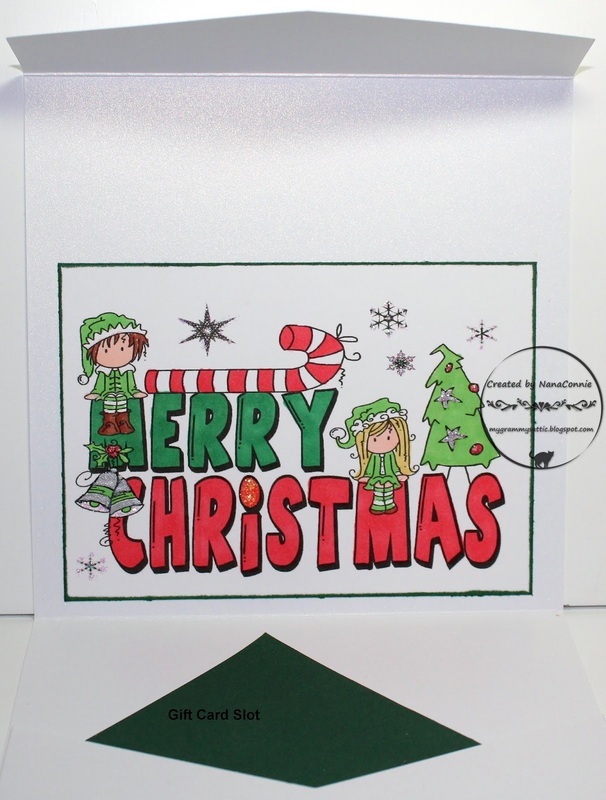 The one today is made with an image from Bugaboo Stamps. I colored with ProMarkers, including ProMarker silver metallic pens on the bells and stars on the tree, then added glitter to the snowflakes and the dot in the "i" of Christmas. I die cut the image with a rectangle die from QuicKutz, and inked the edges. This is an all-in-one card and envelope. The image piece was mounted onto the central section of what would become the inside of the 'envelope' for the gift card. I trimmed the top edge to make a wide arrow-point, then used my Scor-Pal to score across the width about 2 inches below the top, again just below the image piece, and once more 2 inches up from the bottom of the CS. I folded at each of the score lines, then cut the very bottom into a dove-tail. I used double-sided tape to adhere the folded up, bottom flap to the card back along the outside edges, making the slot for the gift card. The image will fold down onto the gift card, and the arrow-point flap seals it closed. The back side of the card is the outside of the envelope and, because the image is inside, there's plenty of room for the recipient's name (and address, if being mailed.) The green CS is in the pocket just to show where the gift card will be. Gorgeous gift cad holder with lovely coloring, Connie! Thanks for entering the ABC challenge at Catch the Bug. Good luck with the next days! This is fabulous and what a wonderful idea. Love the image and gorgeous colouring too! That's a perfect stamp for your gift card holder! Whoever gets this is going to love it - and also what's inside! Love this! Great coloring too! Perfect gift card holder card! Super cute! :) Thanks so much for playing along at The Bug Blog with Bugaboo Stamps! We hope you'll join us for our newest challenges soon!